This post was re-blogged from the original with the kind permission of John Black. An admission: I have a fetish for chairs. As a designer, chairs offer the best opportunity to design from a sculptural aspect. Coupled with my historical jones, it should not be surprising that the one chair design that stands out is klismos. Given the timeless nature of this chair, it is no wonder other furniture designers have gravitated to this form as well. But what I find as interesting as the chair itself is the diverse personalities involved with bringing this form, along with ancient Greek ideals, back to life. The extravagant Thomas Hope (1770-1831), son of one of the wealthiest banking families of Europe, was a collector, author, patron and furniture designer whose designs were inspired by Greek, Roman and Egyptian styles from his 10-year Grand Tour of the Ottoman Empire. 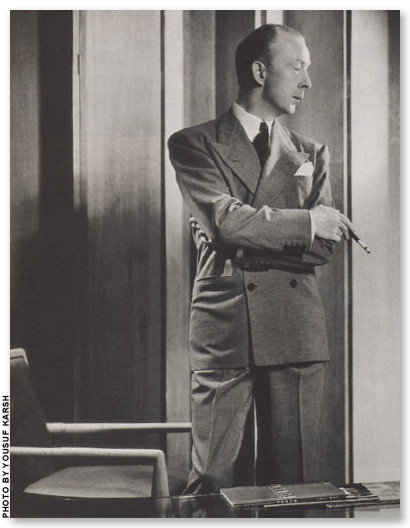 He made klismos a commonplace word among a new generation of designers and architects. Thomas Hope, known for fanciful indulgences, chose to have him self depicted in rich Turkish dress for his portrait in 1798. He believed that England needed to return to “true elegance and beauty” in dress and design and so modeled his surroundings around the influences of the Greeks and Romans. His year long stay in Constantinople, which influenced his first book on fashion, “Costumes of the Ancients,” might help us to understand why he selected this particular outfit for his sitting. 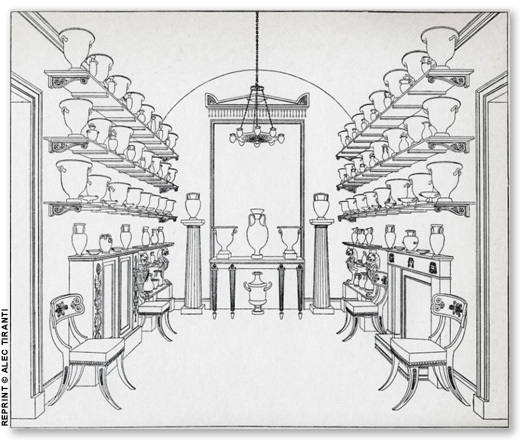 Hope’s drawing of his Urn room with one of his klismos designs prominently displayed. Benjamin Henry Latrobe painted by Charles Willson Peale, 1804. This portrait indicates his stature among the important citizens of Federal America. I love the artist’s touch showing Latrobe’s glasses sitting on top of his head. On this side of the pond, one such person to reference Hope’s book was British born, Philadelphia architect and designer, Benjamin Henry Latrobe, also enthralled with Ancient Greece. Two separate commissions demonstrate his admiration for klismos. This chair, commissioned in 1805 for the Waln family of Philadelphia, is thought to be the first American adaptation of the klismos form in the United States, although here, the legs only flare and are not true saber legs. This design was as avant-garde as anything produced in London or Paris at the same date. As a true example of unique styling each crest rail in the set of chairs features a different composition of mythological creatures. 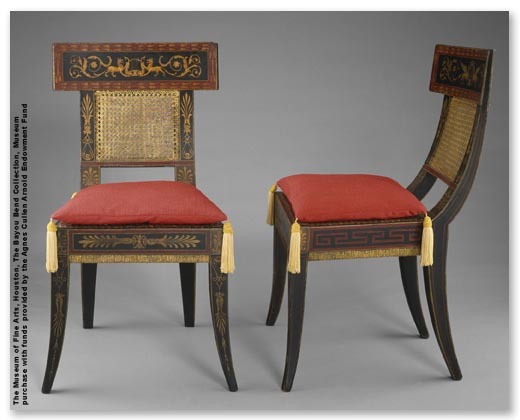 The chairs Latrobe designed for President Madison and his wife, Dolley, were destroyed in the fire of 1814. This exact reproduction is based on Latrobe’s drawings, above. 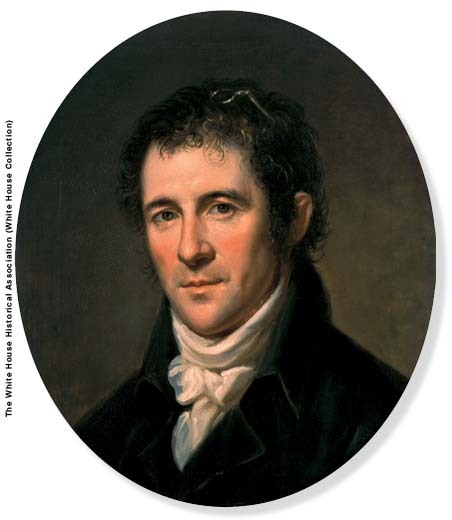 His second commission was for Dolley Madison. It was she who wanted to open the “people’s house” to more informal gatherings of men and women, in the tradition of the French salon. Where the modern classical taste embraced the klismos form as a symbol of grace and beauty, the engineering behind the ancient design had been lost. To be fair, his insistence on exactly following his designs raised issues of structural integrity, as several broke when sat upon. Some things never change. T.H. Robsjohn-Gibbings championed the cause of American furniture design independence and thought he would be remembered above all else for the klismos chair that he first “designed” in 1937. 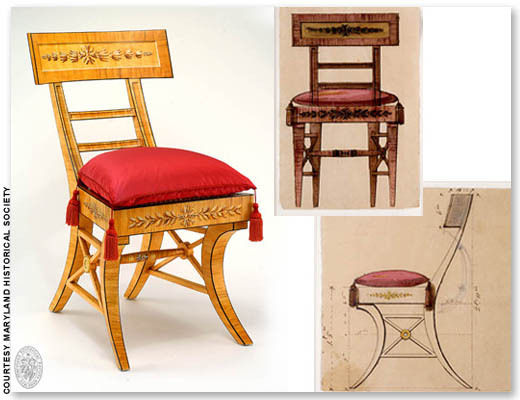 Although he was quite aware of Greek Revival renditions, Gibby, as he was called, believed no 18th or 19th century furniture designer captured the grace and proportion of Greek furniture that belonged to it and to it alone. 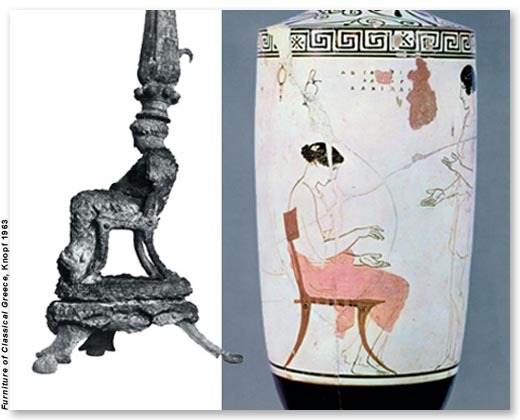 In the 20th century he discovers for himself the purity and flawlessness of the original Greek forms. Who saw it first? Perhaps, if the Internet had existed during his time, he might have discovered that a Danish designer, in 1790, had also been smitten with Ancient Greece. 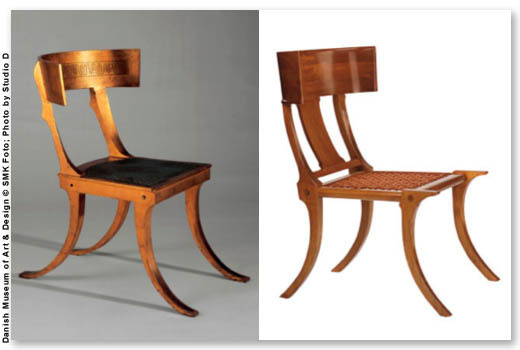 Klismoi designs by Danish designer, Nicolai Abildgaard, 1790 (left) and Robsjohn-Gibbings, c. 1960 for Saridis. It’s apparent we’re drawn to the klismos form. I know I have used iterations, as have others in this century. What will the next generations of designers bring to this form? Will we find the klismos forms created in the future as inspiring as the Hope, Latrobe and Robsjohn-Gibbings’ interpretations of centuries past? For a more thorough and fascinating read on Thomas Hope and his life and time, I highly recommend, “Thomas Hope, Regency Designer,” edited by David Watkin and Philip Hewat-Jaboor. “Household Furniture and Interior Decoration” by Thomas Hope. This entry was posted in Art History | We love... and tagged Chairs, Design, John Black, Klismos. Bookmark the permalink.